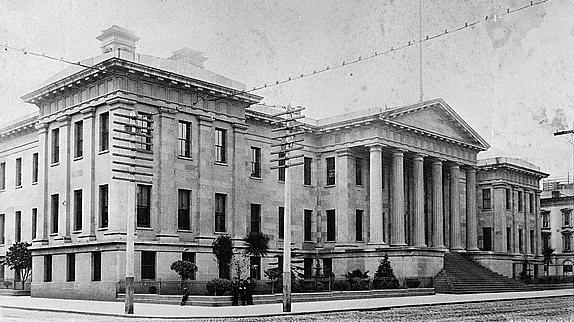 The San Francisco Mint is a branch of the United States Mint, and was opened in 1854 to serve the gold mines of the California Gold Rush. It quickly outgrew its first building and moved into a new one in 1874. 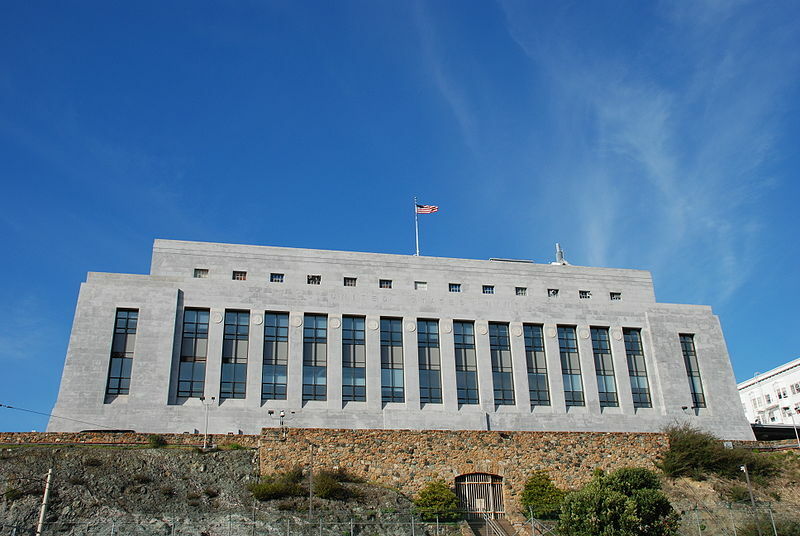 This building, the Old United States Mint, also known affectionately as The Granite Lady, is one of the few that survived the great 1906 San Francisco earthquake. It served until 1937, when the present facility was opened. Within the first year of its operation, the San Francisco mint turned $4 million in gold bullion into coins. The second building, completed in 1874, was designed by Alfred B. Mullett in a conservative Greek Revival style with a sober Doric order. The building had a central pedimented portico flanked by projecting wings in an E-shape; it was built round a completely enclosed central courtyard that contained a well—the features that saved it during the fire of 1906, when the heat melted the plate glass windows and exploded sandstone and granite blocks with which it was faced. The building sat on a concrete and granite foundation, designed to thwart tunneling into its vaults, which at the time of the 1906 fire held $300 million, fully a third of the United States' gold reserves. Heroic efforts by Superintendent of the Mint, Frank Leach, and his men preserved the building and the bullion that then backed the nation's currency. The mint resumed operation soon thereafter, continuing until 1937. In 1961 the Old Mint, as it had become known, was designated a National Historic Landmark. The Old Mint was open to visitors until 1993. In 2003 the federal government sold the structure to the City of San Francisco for one dollar—an 1879 silver dollar struck at the mint— for use as the Museum of the City of San Francisco. In the fall of 2005, ground was broken for renovations that would turn the central court into a glass-enclosed galleria. The Museum is scheduled to open in 2012, but the Old Mint is used for special events, some open to the public, prior to the Museum's official opening. The new Mint was opened in 1937. Beginning in 1955, circulating coinage from San Francisco was suspended for 13 years. In 1968, it took over most proof coinage production from the Philadelphia Mint, but continued striking a supplemental circulating coinage from 1968 through 1974. Since 1975, the San Francisco Mint has been used only for proof coinage, with the exception of the Susan B. Anthony dollar from 1979-81 and a portion of the mintage of cents in the early 1980s. The dollars bear a mintmark of an "S", but the cents are otherwise indistinguishable from those minted at Philadelphia (which bear no mintmarks, unlike those years' proof cents from San Francisco and circulation cents from Denver). From 1962 to 1988, the San Francisco Mint was officially an assay office; the San Francisco Assay Office was granted mint status again on March 31, 1988 (Pub.L. 100-274). The San Francisco Mint is located at 155 Hermann Street, but does not allow visitors.